Kelli Nina Perkins: Hot! Hot! 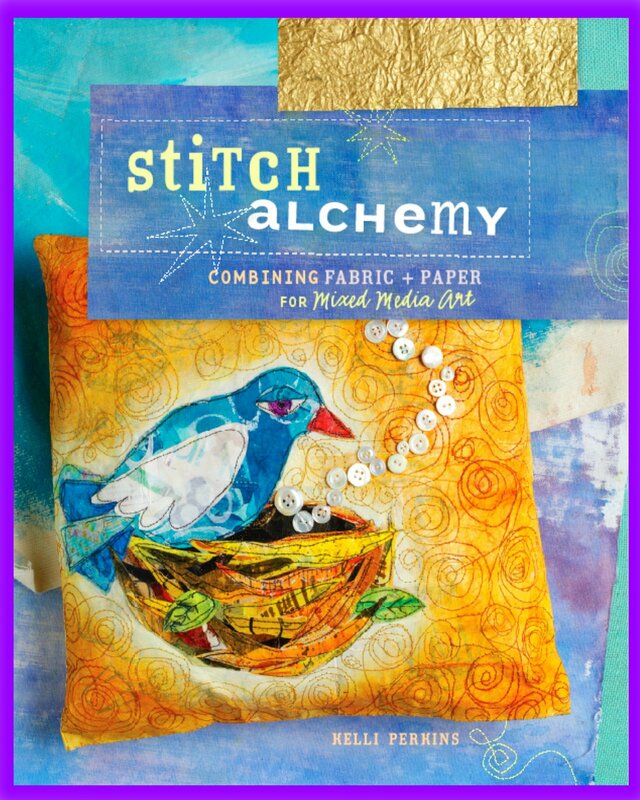 Giveaway STITCH ALCHEMY, STITCH IMAGERY & GIFT! - Winner Announced! Hot! Hot! Giveaway STITCH ALCHEMY, STITCH IMAGERY & GIFT! - Winner Announced! Today's my day....Hooray! 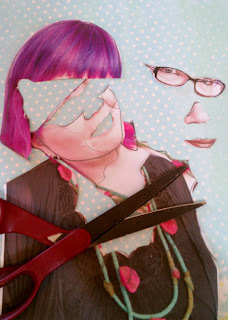 Here's a little tutorial on making a stitchpaper self portrait, since I'm in the midst of my 30 day Self Portrait Challenge. This project is made with stitchpaper from the book Stitch Alchemy. All of the instructions as well as oodles and oodles of ways to embellish your own stitchpaper, plus plenty of projects are included. Interweave Press will also be giving away my DVD Stitch Imagery, which will show you how I create lovely stitched fabric art from a simple photo. You will LOVE this process! I'll be teaching it at ART CAMP FOR WOMEN in October. 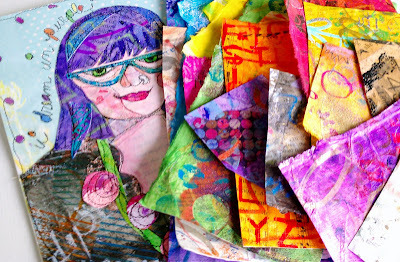 Finally, I'll personally send one winner a delicious packet of handmade stitchpaper so you can create your own self-portrait, gifts or greeting cards! In order to be eligible for this giveaway, please pop over to the Art Camp for Women site and take a peek to see what's going on. Feel free to "like" ACFW--I do! Then leave a comment below letting me know what you love about Art Camp. On August 20 I'll draw one lucky winner who will get the book, dvd and pack of wild and luscious stitchpaper! Now, on to the tutorial for today. Begin with a photo self-portrait that you like. Print it out on paper, sized to your finished project. You'll need a pencil, scissors and a glue stick. Find a piece of background paper that appeals to you. I'm using scrapbook paper and I've glued it to a piece of watercolor paper to make it stiffer. Outline the major elements of the portrait with a pencil so that you can cut them out. Focus on the places that are different areas of color, including shadows, plus obvious elements like facial features. Begin the dismemberment! Without cutting any of yourself in half, snip around the parts to cut them into shapes. You'll use these shapes to cut pieces of stitchpaper or decorated paper and reassemble yourself. Use the parts as templates to recreate yourself in living color. If one piece will be covered by another, leave a little bit of a margin so that the background is not showing. In this example I'm using my head and shoulders as the base layer and topping it with my blouse and hair, so I've added a little to the main head piece. Cut out the rest of yourself and lay the pieces down to test placement. Use a glue stick to tack them down. If you don't have a piece of stitchpaper or decorated paper that matches the color you want, consider making one or using a neutral piece, then painting it after it's attached! When you've got yourself reassembled, hop on over to the sewing machine for a little outline free-motion stitching with black thread. go around the pieces and parts, then add extra lines as if you were sketching. Use stitching to add a border to your piece and even text if you dare! Now, there are no rules, so grab some more art supplies and let's get busy. 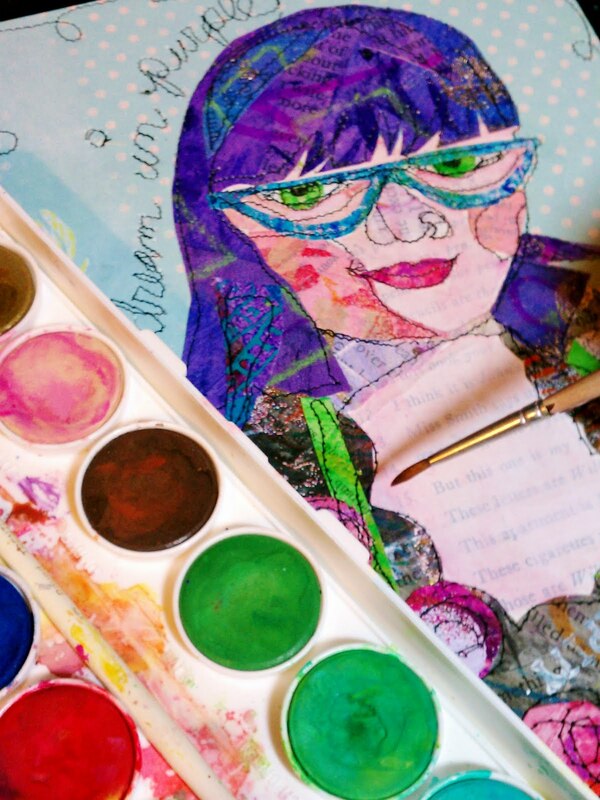 Use watercolor or acrylic paints to bump up the color or make changes to your self portrait collage. You can adjust skin tone, emphasize shadows or add color. Use a marker to fix any stitch lines that meandered a little too far from the mark. Here's my finished self portrait. I enjoyed the process, but you'll note that there is something distinctly "off" about my glasses. The truth is that my eyes blew away when I was working and I couldn't find them! I suspect the cat may have run away with them. So I just cut my glasses out freehand and I ended up with a different shape than my actual glasses. There is nothing wrong with altering any part of your self-portrait. That's the creative process! that is so cute! thanks for sharing how you did it!! Thanks for the tutorial, I love it, even those wonky glasses! I've never been to camp, let alone art camp but it sounds like fun and a great place to meet people and share and exchange creative ideas. I think this sounds like an interesting technique to try! Thanks for the opportunity to enter! Since I don't even know what stitch paper is, I think I really need to win this giveaway. Loved the tutorial! Great tutuorial, Kelli. I'm looking forward to trying it! Happy Birthday. ACFW looks amazingly fun and in a beautiful location. The best thing is getting to spend time with the other campers and not having to return to hotels. wow, Art Camp sounds fantastic! I will definitely keep an eye on it's schedule for next years vacation! I would love some of your stitch papers...and of course, the dvd/book..
fantastic how you gals keep us involved and moving with the challenges and the giveaways...all my favorite people! oh and Happy Belated Birthday, Kelly! Thank you for this opportunity. I have Stitch Alchemy and it is definitely one of my go-to-books. Would be thrilled to win your HOT giveaway! Great tutorial! I have your book and use it often! As for Art Camp, I like the idea of getting away to play with other people who like to play!!! Love the self portrait. What about art camp--well Lori, of course and the wine and chocolate and the new friends and last, but certainly not least, the art!! My favorite thing about your Art Camp is that everything is included. I'd love to go to Art Camp...in my pj's, no less...lol..maybe that should be your next giveaway (just a small hint)...I'd also love to win this giveaway....your tutorial has me very interested. The thing I think is great about Art Camp for Women is that you don't have to spend oodles of time figuring out what art supplies to bring and what and where to eat - it's all included! 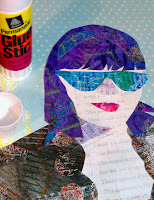 Kelli, these stitched portraits look like so much fun; thanks for the tutorial! Your Art Camp, especially since it is in beautiful Colorado, would be a dream come true. 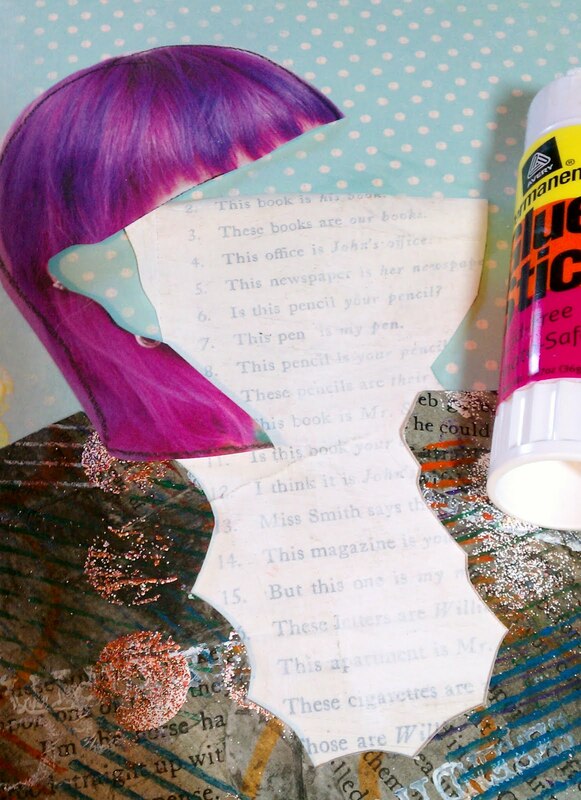 Wow, art camp sounds like it would be so much fun and really recharge the creative battery! Love your self-portrait! Thank you for pointing out the ACFW! I hadn't heard of it before but will put it on my bucket list! Fabulous that they include everything but transportation! For a week! Art Camp looks like fabulous fun in a beautiful, inspiring location! Thank you for a great giveaway and self-portrait tutorial! I'm inspired! Art Camp for Women sounds like it would be an amazing experience to be around like-minded women and have art classes too! Wish I could go. I haven't done the kind of art that you do and I would love to learn. I am bookmarking your blog to come back and try the tutorial you have posted today. It looks like so much fun! I'd love to win this giveaway. Thanks for the opportunity. I've always wanted to go to Art Camp for Women! 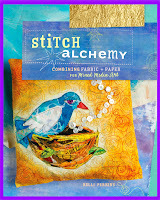 I have Stitch Alchemy on my wish list. Everything looks so good! I need more time to try everything! I have never been to art camp, but I know I would love it! Would love to win your book and dvd...pick me! Thanks for the giveaway. Art Camp sounds like a great :change" for me -I am ready to pack up and go in October - will look at the registration and hopefully be able to go. Love your blog. Thanks for the tutorial. Also love the idea of Art Camp! Have done something similar with my quilty friends and it is always amazing what you learn from being around a group of women! Have seen your book but don't own it, maybe today is my day to win! WOW Kelli! Thanks so much for this. I will disqualify myself from this drawing, but I'm getting your book out TODAY and getting to work - I mean play. Lori W at Art Camp for Women. An art camp for women! What a wonderful idea. We spend so much time caring for others, a wonderful time to play freely, like when we were kids and just have some FUN! Thank you for the self-portrait tutorial, I'm going to have to try it. If I like the way I look with colorful hair I might even try it! What a great post! I love the tutorial and the Art Camp looks VERY tempting! Especially since you guys have made it so easy, even art supplies are included! I do "like" the Camp 7 have signed up for the newsletter. Thanks for the giveaway! This looks like such a fun project to make! And art camp looks like a blast! Everything from the area to the chocolate and wine, not to mention the great crafts, sounds like a dream! Very cool! The Art Camp looks like a lot of fun; the small size would be wonderful and I love the size of the clothing suitcase in comparison to the art-supply suitcase. Would love to receive your give away. I'm going to do your self-portrait technique with my two grand daughters next time they are over. They will love it and so will I. What do I love about Art Camp? I love EVERYTHING about it and would love to do it someday when my kids aren't so needy. I think the all-inclusiveness of Art Camp is a brilliant idea. It would be great not to have to take a boatload of supplies, as would knowing how much it would cost so there would be no nasty surprises. Having great teachers is important too, of course! Art Camp...what's not to love?? Fingers crossed I get to come play one day...I can think of no better place to let creativity take over! Cool tutorial, too! Hey happy birthday Kelli! I loved the video of your projects at Art Camp for Women. It looks like a blast. What a fun tutorial - I may have to give this a try! To play in such a beautiful location with such talent teachers.....ahhhhhh. I think the tape lesson looks interesting. I hope I win your goodies package along with your lovely book! Cheers and thanks. Your post made me smile. I love it. Thank you for the tutorial and give away. The most appealing part of Art Camp for Women is the location. It looks beautiful. I can't say the plate of chocolate truffles was a turn off either! I've never been to Art Camp, but I've watched enviously from the sidelines. Every day, immersed in creativity - that's what sounds amazing! Thanks for the chance to win! Art supplies, happy hour, hot springs, and hanging in my pajamas? Throw in a bunch of talented women and that's a recipe for pure happiness! I also LOVE your stitch project. Amazing stuff. Can't wait to try this self portrait idea---Art camp sounds like fun!! Art camp simply looks like a dream come true!!! Wow! how could any one even think of something so fun!! looks like it would be a perfect place to play! I like that everything is included in the price of this camp, it makes it really easy. The fabulous instructors, classes and scenery also make this camp sound wonderful. Wow..Art Camp sounds wonderful, especially since all the cost is up front. There is nothing worse then getting to take classes and finding all sorts of "extras" you weren't planning for. Wow - what's not to love about Art Camp? Art, great teachers, great setting, great food. Sounds wonderful - wish I could go! What a generous giveaway! Thanks for the tutorial. It looks like just the thing to get my little quilt art group off the ground again after our summer vacays. Everything about Art Camp sounds fantastic! I especially like that everything is included in the cost that is posted. I also like the variety of topics and the instructors. This is my favorite self portrait from your series yet! So cool! Also, I would LOVE to hang out with a bunch of women making crafts at art camp! Maybe I can save up for next year! 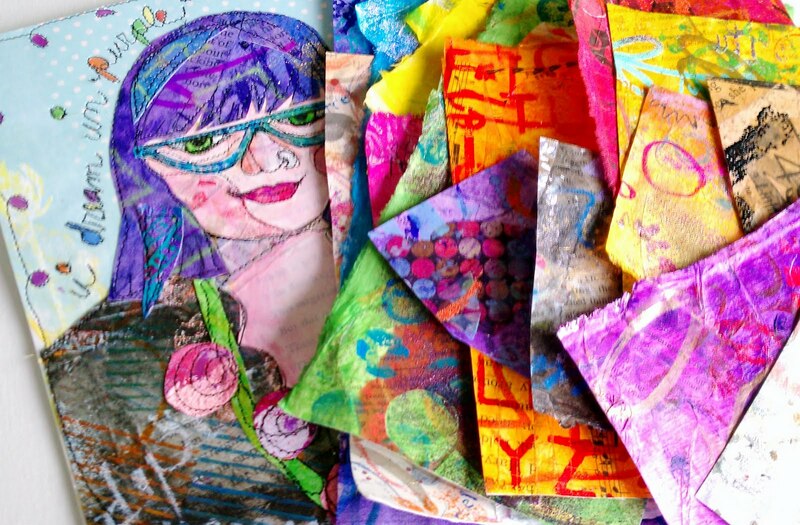 Top of my Bucket List: Art Camp For Women! What appeals most to me is the talented instructors, the camaraderie, art in my PJs, someone else making my food; so apparently I like everything! Thanks for the tutorial I'll have to give it a try. I love your tutorial you share here! 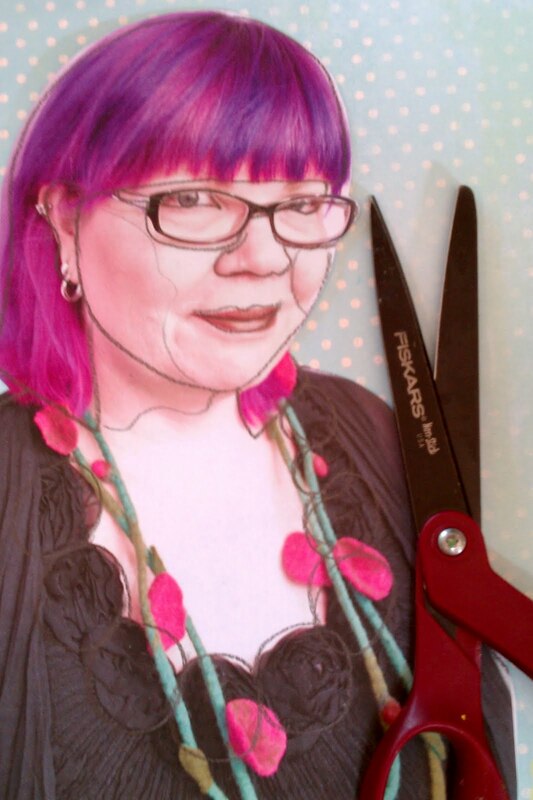 Wow it wouldn't get any better than winning your book, DVD and your handmade paperstitch! I liked the FB page for the Art Camp. I love that they furnish all the art supplies! Thanks for such a generous giveaway! Hi Kelli! You're amazing...I love your tutorial and I really love making stitch paper. It's the perfect blend of fabric and mixed media. Take me out of the drawing of course and I can't wait to see you in October at Art Camp for Women! Lorri F with Art Camp for Women. Just being there with like minded women would be enough for me. Stitch paper sounds so much fun. I'd like to try it! Thanks for offering your prizes. Art Camp looks fabulous. I think my favorite part would be spending time with other "like-minded" women. Sometimes doing art can feel very solitary, lonely unless you have friends that share your passion. When I win the lottery, I will definitely be going to art camp. Thanks for offering these wonderful freebies. Showing up for breakfast in my pajamas... now surely that must be the most unexpected awesomest treat to ACFW! LOVE, LOVE, LOVE today's tutorial... thank you for posting it and giving all us the opportunity to win your book and DVD! Gobs of fun must await in those! Enjoy! What a great tutorial! You make it look so easy. I enjoyed visiting Art Camp for Women, it sounds like it would be so much fun to participate in one of your camps....the margaritas sound really good! Oh, how I love, love, love the art camp description, especially the way you've thought of absolutely everything. A friend and I were talking about how envious we were that our kids got to to to great camps this summer--one of these days we'll be through paying for theirs and we'll show up at YOURS! Art Camp looks amazing, especially in beautiful Colorado! Love that it's all about art & fun and more art...!! The tutorial was fascinating to see the photo turn into such a nice piece of art! I'm impressed with your talent = ) I've never tried this type of art but I'm willing to give it a go if I win!! A wonderful self portrait. Art Camp For Women sounds so relaxed and in a beautiful setting. How fantastic not to have to drag a long all your art supplies as well. This sounds like the perfect get-away - Being creative and meeting new people - How could you go wrong? I would LOVE to win! What I love about the idea of art camp is to get away from the daily routine and just be yourself, having fun, making new friends, laughing, making art, enjoying outdoors, reconnecting with your art self, eating meals that someone else has cooked....gosh, what's not to like about all of that? The art would be spectacular, stitch alchemy is...turning the ordinary into gold. I wanna do that. I specially love THE glasses! Would love to get THE book! what a fun idea. i love the necklace, looks like my ficklestick necklace. Oh, my does this all look like fun! Camp! Wow. It has been too long since I did anything like that. In another lifetime, I was involved in watercolor workshops which was not quite "camp" but close. Miss it! These techniques look like fun to learn and apply. Creative women group together for strength and creativity. You've inspired me!!!! Thank you. I love that it's all included and you only have to think about making art! I love the idea of art camp - mostly for the location. Nature has always been an immense source of inspiration for me and I think that Colorado is one of our most lovely states. Also thanks for today's tutorial! I prefer photo tutorials to video tutorials and I especially like your portrait style. Art Camp looks like a great place to enjoy being creative. One of these days I'll make it there! First I love your self portrait! Thanks for the instructions (love that your cat ran away with your glasses)! The art camp sounds great and I love that the supplies are included. Art Camp for Women sounds like an ideal get-away. I like that everything is inclusive; the meals, lodging, art supplies and classes as well as a few extras. I would love to attend but my current budget will not allow it. But, I would love to win your Stitch Imagery DVD! Kristin F. kalfarwig@bellsouth.net (for some reason google is not saving my comment, even though I have an account). ACFW looks amazing! The scenery, the all-inclusive price, the camaradarie - holy moly! Not enough time to save my pennies for 2011, but maybe next year! LOVE you tutorial above - this is a totally new technique for me but I find it very compelling. I'd love to win your giveaway, and can't wait to give your tutorial a try! Thanks so much for posting. Thanks for the great tutorial! ACFW is such a cool idea! Love that all supplies and food are included! Genius!Such a gorgeous location too. It's now on my radar for future events. I'd love to win your dvd and stitch paper! WOW! The Art Camp for Women sounds like a perfect retreat for getting away, playing with art stuff, and having fun. Thanks for the info and opportunity to be in the drawing. Art camp is something I am going to save for. I like the opportunity to learn from wonderful artists. Love your tutorial. Thanks for a chance to win your book. Art camp looks wonderful. I love the photo of the participants -- I would definitely enjoy spending time with a talented group of women, learning new things. Nice, this looks like something fun to do with my kids now that they are older. What a cool self-portrait! I would love some of your stitch paper. Thanks for the chance to win. First, thanks for the step-by-step portrait, I'll have to try that. I checked out the Art Camp for Women, and it looks wonderful. I don't travel much, but I love attending art retreats. This is great...and PERFECTLY timed, as I'm attending a gathering of my art peeps this weekend and have been trying to come up with a self portrait that's different than my usual realism. This is PERFECT...sorry, can't talk anymore...gotta get started! Thanks for the great tutorial. 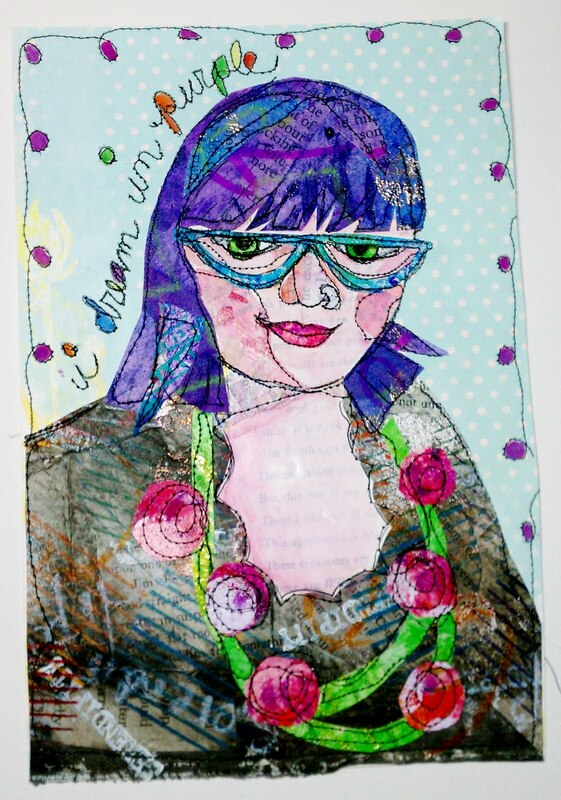 I have been working with a class on self portraits and the stitch paper ideas will add another dimension. I have read so much of your work and implemented ideas .... you write in a contagious, easy to follow format which I love. Hope I'm the lucky one! It looks such a fun environment with like minded folks AND - theres a Happy Hour!!! Ooh! Ooh! Love the tutorial! Need more of your instruction. Sorry I can't attend camp. Would if I could. A book and DVD would be nice though. Great tutorial. Thanks for sharing. I really wish I could go to your art camp. I love the fact that the art supplies are included. Thanks so much for the tutorial. I love that everyone goes to the same classes so everything stays small. It also looks like a gorgeous setting!! I did not know that Art Camp for Women existed. I think it needs to go on my bucket list. I would love to win your prize package! Thanks for the tutorial. I think it looks like great fun, and I could picture myself with purple hair or some such by doing it. Thanks for the opportunity. 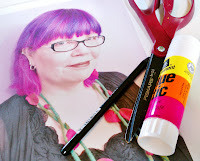 I love the idea of an art camp with all art supplies included in the price...genius. wow- love this self-portrait concept. Okay- I went and "liked" Art Camp for Women- the thing I like best I think is that it is all inclusive-just pack and go and don't worry about the rest. Can I move into the camp? It sounds wonderful, especially the hot springs - ahhhh. Your book and dvd are fantastic. Thanks for the tutorial. Wishing you a fun rest of the summer. ACFW looks like a great time away to learn and play! And eat!!! Love the tutorial. Can't wait to try it out. Love your book, and the portrait is such fun, thank you for the opportunity to compete for your give away. Way cool. you've just inspired me!! Thank you. I love the idea of women inspiring women and having the luxury of a retreat experience CREATING!! Wonderfull tutorial! Art Camp sounds great, wish I was able to afford to come to the states to attend. ACFW, what a wonderful opportunity to find inspiration and learn from talented artists. Thanks for the tutorial will definitely give this a try. Art Camp sounds like heaven. It can't get much better than that. Would love to learn more about the self-portraits. Thanks. Your eyes blew away, or the cat ran off with them. heeheehee! That made me laugh out loud. Art Camp for Women sounds really neat, especially the part about just being able to go and have fun without all extra planning and re-planning of how to transport supplies, how much money to bring for food, etc. Thank you for the tutorial and the chance to win the DVD, book, and stitchpapers! I love that you are doing this and your stitch paper. I love that Art Camp has all the supplies for you so I don't have to lug it with me. I need a retreat where I can recharge my batteries. Most of all, I love that you are there! Art Camp sounds wonderful, but I live too far away in Australia and there is a need for that sort of thing here ! I would love to be able to go to Art Camp. It looks like so much fun. Thank you for the tutorial! I've never been to c art camp but I think it is a good way to get away from everyday routine and spend time with creative girls, learning, exchanging ideas and experiences and having fun! What I would love about Art Camp is that everything is included, even supplies! It would make traveling there so much easier. The only other thing that would make it perfect is if I was there! Thank you for the chance to win your wonderful book (that I have been drooling over), the great DVD and your wild and luscious stitchpaper! I really enjoyed your self portrait tutorial. What Fun... Thank you for sharing !! OMG! I love your web site and your ideas. The ACFW sounds like so much fun. 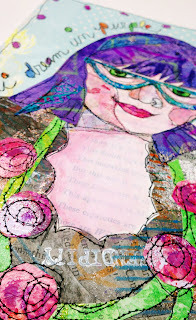 I am just beginning to do art journals, so your link to "how to make art journals" was extremely helpful, and your lesson on your web site is something I just have to try! sounds like great fun. wish i could go and i love that EVERYTHING(including chocolate and wine)is included in the price. what a deal!!! Art Camp looks like it would be a fabulous experience! Something to plan on attending in the future. Looking forward to receiveing the newsletter and hearing about all the fun projects. This week of contests is a great way to learn about new blogs (well, new to me)! Art + Camp + Creative Women = Fantastaic! Oh my just left your art camp site and it sure looks amazing,,,,Maybe one day I will be able to go. Thanks Kelli for the tutorial, i will be trying it out. Thank you for being so generous with the gifts. I am so going to make my own self-portrait... thanks for the tutorial and thanks for the chance to win! Sweet! Art Camp for Women has all the elements that a creative woman would love: Commraderie with like minds, comfortable accommodations, good food, hours devoted to creating art, hours for relaxation, rest, fun, friendship. What's not to love? I have never seen this technique, but I really like it and am intrigued by it. I did one of myself from a photo, and used wool, fabric and yarn for my hair, but still need to finish it off. I have you bookmarked so I can come back and see more about your art and techniques. The camp looks fun and in a beautiful area. I like the idea of being able to create in a natural environment that you can enjoy hiking and sight seeing while there. That Art Camp looks like a really good program! I think it's great that everything is included in the price. I like the all inclusive element and the location along with the ability to get away with women who enjoy the same things. I like the fact that all meals and supplies are included in the cost. It looks like so much fun! Sure do wish I could be with you in October. This is embarassing, but I had a looooong day at work, and the daily happy hour sounds fantastic! Art Camp for Women sounds so fun. It's nice that they provide all of the supplies and just about everything else you could imagine. Colorado is so beautiful. It's a great location for the camp. I like your portrait project demo in this post. I might give it a try. Thank you so much to have the opportunity to win. I never win anything but I do not give up! Congratulations - I like your work. For someone, like me, that can't decide what to take to retreat/camp/workshop, having all the art supplies and everything else supplied, is just the bee's knees! Thanks for the tutorial! Art Camp sounds exactly like what I would love to do with my time off! Unfortunatey I've got a commitment for this fall, but I will be checking back. 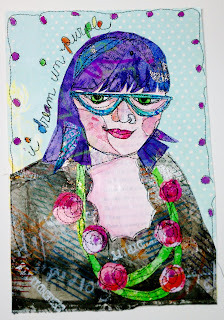 And I love this self portrait technique....can't wait to try it so I hope I win the drawing with the stitch paper! Now I want to do a self portrait! Thanks. I like the camp does the journal swap--what a great idea to keep in touch and share after camp ends. Art camp for Women. Where have I been.?! the whole things sounds wonderful. the pictures of the area are super. looks peaceful. And thanks so much for the tutorial.I gotta try this. love, love, love this book and all the goodies. Art camp sounds like it would be a lovely time to hang out with like minds and create colorful stuff! Wish it was closer to NC! Was so into trying out this tutorial yesterday I forgot to leave a comment! I love the idea of not having to bring your own supplies to Art Camp. Thank you for this opportunity. LOVE the fact that everything (including wine and chocolate) is included in 1 single price. Will seriously consider attending a retreat - I love Winter Park! Wow where can I start. Art camp looks amazing. We have nothing like this in New Zealand. It sounds like heaven on earth.....art till you drop, no kids for a few days, no responsibilities and best of all lot of people around who love making art as much as me!!!! So my vote goes for the blog - at least I can participate virtually. At Art Camp, they not only inspire you, but they take care of you. Imagine not having to worry about the cost of the meals, transporting the supplies, figuring out a complicated agenda. Just a chance to play, play, play; create, create, create! What I liked about art camp for women, is that it is featuring YOU as an instructor this year. Have always wanted to go to Art Camp but right now I am committed to help my elderly mother who has not been well for several years. I hope to go there in the next few years. I really enjoy reading your blog and seeing what you do. I love the colors you assemble together. I bought A Winter Seat from you earlier this year. You are a great inspiration! Funny, I just saw an ad for Art Camp for Women in the latest issue of Cloth Paper Scissors magazine today. I recognized the logo. It sounds amazing! The facilities look gorgeous and the classes sound awesome. I think the thing I like best about it is it sounds so inspirational and educational. It would be so stimulating. I'd love to attend. The Lori's that run ACFW are so passionate and patient with the women. The best thing that I like is that it is a safe and fun place to explore color, texture and pattern. Thanks for the tutorial! The self portrait challenge would be great fun. Ooh, I'm drooling over Art Camp. I even checked out airfare to Denver. The structure and the easy no-worry prep looks very enticing and a hot spa night? Omigod. I wish I could go! Also, your self-portrait tutorial is very inspiring. You make it look so easy I have no excuse not to try it this weekend. Art Camp...that is all I need to know...and in beautiful Colorado....I am saving up so I can hopefully attend next year! Thanks for the tutorial...a new technique to try! I looked at ART CAMP and it sounds like a dream come true---especially having everything included! Definitely the way to go! I would adore having your book. What a great technique! I love your self portrait. Your work is inspiring. I love this!!! SO awesome! And Art Camp - omg - it sounds divine! Being able to get away with artsy women, with everything included, (even SUPPLIES!) and just make art and have fun...ah...I NEED that! But in the meantime, your stitchpaper and DVD and book sound lovely!!! 1st off thank you for the tutorial!!! I am thinking I need to save this for myself to do for a couple of birthday gifts for people! Wonderful idea! Next ART Camp sounds wonderful! 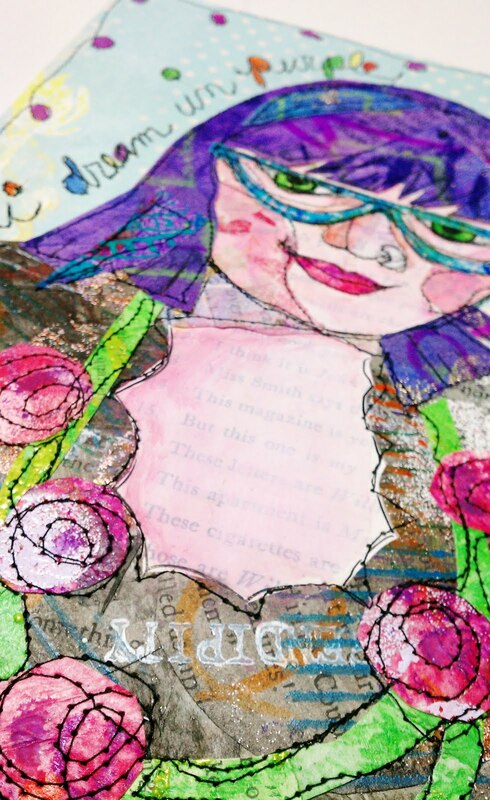 The art journaling sounds like fun, having the supplies included, being located at Snow Mountain Ranch, Winter Park, Colorado... Sounds heavenly! What a great project!! 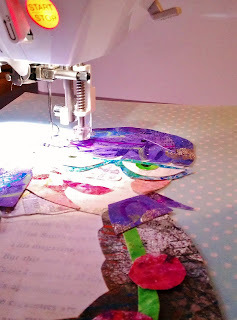 I have never used stitchpaper -- it looks like a fun process!! The camp looks really interesting and of course Colorado is so beautiful. Love your portrait above. For me Art Camp would be about creating beside others and being inspired by them face to face. I live on a farm a fair way from anywhere and I usually only take online classes so when I get the chance I relish being with other creative people. Art Camp looks well planned for learning and fun. a great mix of classes. I like the price comparison chart, too. What's not to like about ACFW! Art, the camaradarie, beautiful Colorado, wine and chocolate. I'd love to do that-but, for now, this tutorial looks like great fun...gettin' on with that! I remember your FUN, COLORFUL & TOTALLY ORIGINAL work that you were demonstrating @ International Quilt Festival in Chicago several years ago. How I would love you book or stich paper to play with! ACFW sounds fantastic. I love that all I have to do is show up and be involved in art. Including everything is a winning idea. ACFW sounds great because a newbie doesn't have to run around and gather supplies that are unfamilar. Arrive, and then have fun. I like inclusives, and also giveaways of quilty oriented books adn supplies -- just now learning machine techniques and experimenting. Thanks for the giveaway.